On the West coast of Japan, is the historic Tsushima Peninsula, an area famous for its fresh seaweed and excellent hijiki. In Japan, where vegetables of the sea are as common to the traditional cuisine as garden vegetables, Hijiki is a favorite. This vegetable from the sea is harvested in the early spring, just as it reaches its peak of flavor. When the lowest tides expose the shallows, the hijiki is cut. After it is washed, the entire plant is steamed for nine hours in its own juices. At this point, the plant has softened considerably, and its color has changed from light brown to black. Left overnight to cool, it is then thoroughly air-dried before being packaged. Mitoku Me Hijiki are the tips of the hijiki plant. 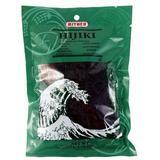 They are harvested at the peak of the season, when the minerals are concentrated in the ends of the hijiki sprouts.